Nokia is a big player when it comes to budget phones and Feature Phones. Nokia has been pushing ahead its Asha range of devices at affordable and competitive prices. Nokia Asha 501 is another device in Asha series which almost looks like a smartphone but Nokia avoids calling it a Smartphone and instead calls it a Feature Phone. The device is primarily targeted to countries like India and other south asian countries where the smartphone penetration is still low and budget phones still dominate the market in terms of numbers. 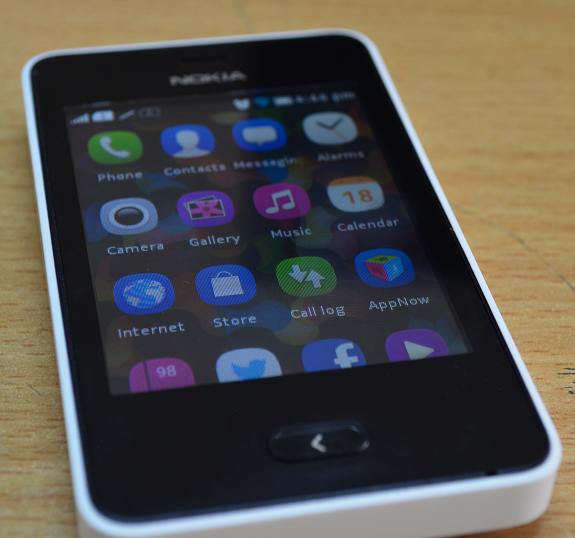 Nokia Asha 501 is priced at $99 or ~5K Rs. in India and is available on e-retailers like Amazon India. Nokia has been leading from the front in designing the Mobile Phones and has produced unique designs which are totally different from the usual smartphones, for its deices like Lumia series. 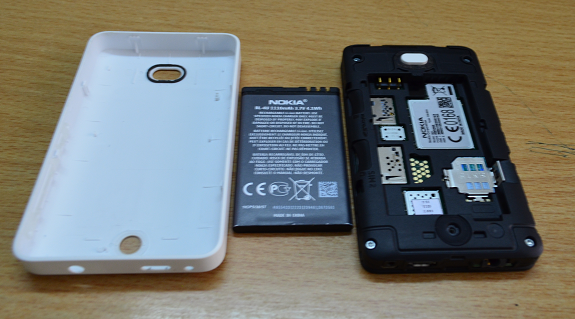 Nokia Asha 501 too comes with a unique compact design. It is a small and compact device even though with plastic covers coming in bright colors. In terms of design, it looks great with just one single back button in the front and the volume rockers & power buttons on the side. The device is 99.2 mm long, 58 mm wide with thickness of 12.1 mm. In terms of weight, the device is light and is well below the 100 gm mark. It weighs just 98gms. The device comes with3-inch TFT capacitive touchscreen with a resolution of 240 x 320 pixels, (~133 ppi pixel density). On that screen size, you wont feel it bad unless you are used to big smartphone displays. In terms of multi touch, two fingers touch is supported. It comes with an Internal memory of 128 MB along with 64 MB RAM. Apart from that, a 4GB microSD card is included with the device along with the support for microSD up to 32 GB. It comes with a rear 3.2 megapixel camera with a resolution of 2048 x 1536 pixels along with support for QVGA @15fps video recording and 3x digital zoom. Considering the fact that the device comes for a price within $100, we shouldn’t expect a better camera. The camera is good enough for casual pictures that can be shared on the web and social networks, but if you want more than that then you need a better camera. The device supports connectivity options like Wi-Fi, 2G, GPRS, Edge and Bluetooth. But it doesn’t support the 3G networks and hence if you are planning to buy thus device, you must keep in mind that the maximum connectivity that you can get while using the cellular network is limited to 2G/ EDGE. 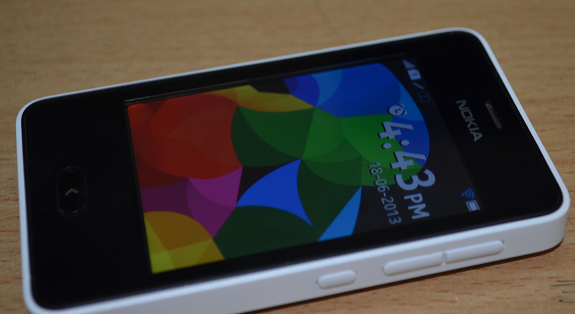 As this is a feature phone and not a smartphone, you can expect much better battery life. Absence of 3G network support too lead to better battery life of the device. The device is powered by 1200 mAh BL-4U battery. We tested the device with moderate and heavy usage with full use of the 2G network and it did last for almost 3 days. Even though the claimed battery life by Nokia is much more, you can expect it to last long enough for few days before you need to charge again. 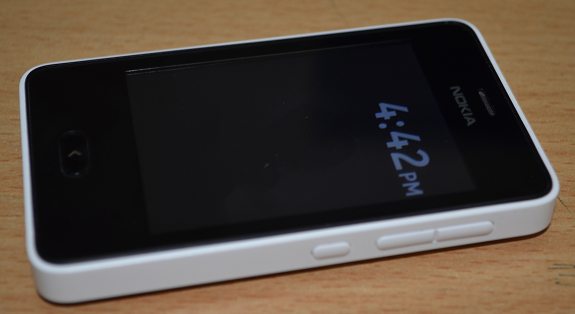 The device is powered by Nokia Asha Platform and not the Windows Phone OS. IT comes with some preinstalled apps like Nokia Browser, Facebook, twitter and many more. You can straight away start using these apps on the device. You can install few additional apps too from the store. 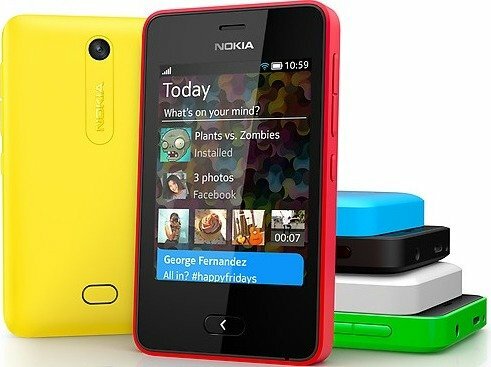 The best part of the Nokia Asha 501 is the new Fastlane home screen which gives you quick access to contacts, apps, music and everything else that you may have accessed recently including the social networks and reminders. The Home screen can be accessed just by swiping on the device screen irrespective of what app you are using at any moment. Apart from the home screen, the Nokia Glance Screen brings all your notifications just like the notification centre of Android though it is not as good as that. It comes pre-installed with few games. If you are even a average gamer, you may be disappointed by the gaming performance. The games just look like old java games and most of us may not like them who have played games on PC. But the target audience may love the variety of games on the device as they may have not played it before. You can install more applications and games from the Asha App store, though you may not get too much to choose from. Just for information for those who may ask, WhatsApp is till not supported on the device and not available to download from the store too. Even though Nokia has promised to bring Whatsapp to Asha 501, we are not sure when it will be coming. Honestly Asha 501 is great device under $100 or 5K INR and I can recommend anyone to buy it, but it may still not convince many users to go for it. The reason being the Asha platform along with lack of options when it comes to apps availability and future development. In addition to that the availability of cheap android phones in the same price range poses a great challenge for Nokia Asha 501. Even though the device looks great in terms of design, hardware and looks, it perhaps lacks something. BY something here, I mean that Nokia is still not able to crack the combination that is need to break the growing dominance of android phones.